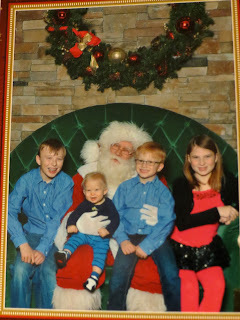 four sweet kids..two with diabetes: Apparently things that make me cry. Apparently things that make me cry. 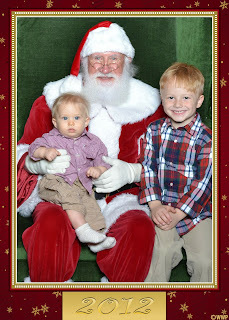 And the one sweetest thing (please don't let this be bragging..) this year? All the hand-wrapped presents with handwritten tags from my children. I began by letting the kids wrap things for each other, then I have left out the wrapping paper, scissors, tape, and tags on my bedroom floor (yes..all month.). What I've learned is that they go work in their rooms, then emerge, and wrap. There are all sorts of beautiful packages under our tree. And I love it. They weren't purchased or ordered. They were dreamed into existence. They have bought a few things for a quarter or a dollar here or there, or used whatever savings they had. But really, like Clay made mustaches for Mary Claire (it's a big fad here, it'll probably be over next month, ha! )...I can't wait till she sees them! They are made from some leftover white furry fabric I had that he was using to make Carter a blanket. They will all be so excited. They are pretty good to appreciate time and effort. I digress! I think all the wrapping started when we began by book wrapping. We wrap a bunch of Christmas books (that we already own! ), and each night we unwrap one (or two), and then read it. The kids are getting to unwrap (which fills a child's need! ), and we get to spend time snuggled together. 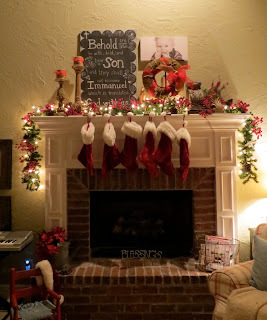 We read The Year of the Perfect Christmas Tree last night (which seriously makes me cry! ..and Ruthie told me all of this), and this morning we read the Polar Express (which also makes me cry..does the bell still ring for you? 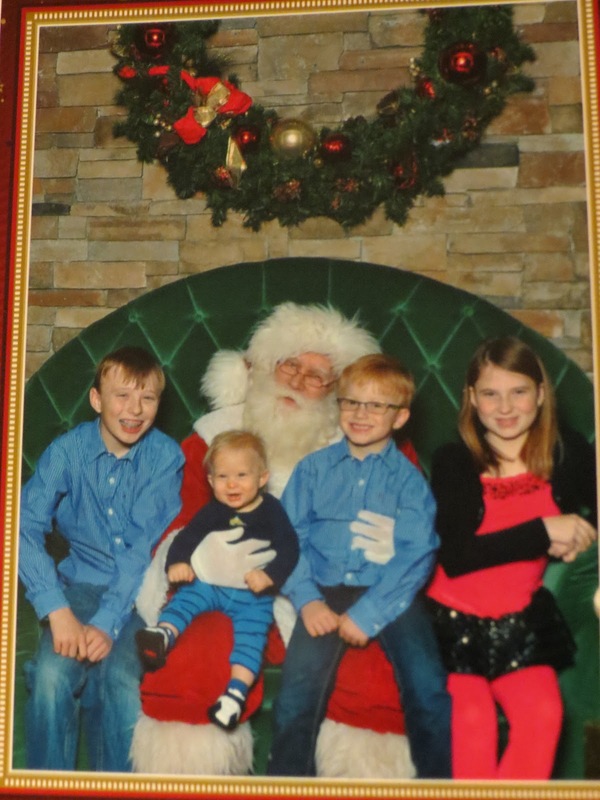 ), and tonight was the Berenstain Bears Meets Santa Bear..which didn't make me cry. ; ) The kids want to read The Gift of the Magi, and I hope we have some more time now that school is out. Ethan is into big books (read: no pictures! )..we have been reading the Wizard of Oz. He says he can still look inside and find sight words. Ha! I hope you are blessed with precious packages and sweet little people. Merry Christmas. Let us celebrate baby Jesus' birthday with joy and honor Him with our hearts and words. Hugs! I like the wrapping a book to read each night...the santa picture is cute! Yay, me! I know, impressive, huh? ; ) Thank you..the kids have loved the books!! I have to come see what you are up to..I got you a gift, are you going to be at children's mass?